Tuesday, Aug. 12 and Thursday, Aug. 14, 10:00 to 11:00 am, Edgartown. Program offering young naturalists a close-up look at native animals of Martha's Vineyard, combining a story, craft and a look at the "creature" of the day. Tuesday it's bugs in general, with Thursday a closer look at our native caterpillars. For children ages 3 - 5 with a parent/guardian. At Felix Neck, $9 ($6 for members). Wednesday, Aug. 13 at 7:30 pm, West Tisbury. Join Buddy Huffaker, President of the Aldo Leopold Foundation, to explore the origins of conservation along with the current and future challenges for sustainability. At the Polly Hill Arboretum, $10 ($5 for PHA members). More info at PHA website. Thursday, Aug. 21 - Sunday, Aug. 24, West Tisbury. It's the 153rd Fair for the MV Agricultural Society! While you're taking in the exhibits, food, and rides, make sure to stop in the main hall to see this year's VCS display. We're hoping for another award-winner! At the Ag Hall and Fairgrounds on Panhandle Rd. Admission is $10 ($5 for ages 5-12 and 62+, under 5 free). Come by Native Earth Teaching Farm between 10:00-10:30 to help feed and collect eggs, or after that for animal visits, spinning demonstrations, and consults. Admission is $5/person or $10/family. For directions and more info, see website or call (508) 645-3304. Relax . . . it's easy! Making great-tasting pickles at home doesn't need to be intimidating, or involve any canning equipment. These easy, no-cook "quickles" will keep for weeks in the fridge and help stretch out the cucumber abundance of mid-summer well into the fall. This recipe makes a strong, garlicky pickle similar to a kosher dill. What's better, if you eat them fast enough the brine is strong enough that you can save it and reuse for a second round of cucumbers. Combine the water, vinegar, salt, and sugar. Bring to a boil briefly, then let cool. Slice cucumbers in half or spears and stuff into jars until very full. Once brine has cooled, fill the jars and refrigerate for at least 48 hours. Sea level rise is of great concern to our island. Our human and natural communities are threatened, and both in a wide variety of senses. We Homo sapiens must cope with cultural and aesthetic change as beaches move and land is lost, the more tangible threats of powerful storms and more frequent flooding, and of course the economic impacts to traditional maritime industries and the modern tourist business. For the flora and fauna of the Island, it is more simply a struggle for survival, made much more possible if natural habitats are preserved to which displaced plants and animals can migrate. Yet in many ways, we should count our blessings, even in regard to sea level rise. Eventually, the Maldive Islands, with their maximum elevation of about 7.5 feet, may simply cease to exist (and fairly soon, depending on your definition of “exist.”) The more pessimistic projections of sea level rise (that incorporate the effects of the melting Greenland ice sheet) suggest this island nation will be almost completely underwater by the end of the century, solely due to sea level rise – and probably gone entirely once storms and erosion are considered. But sooner than that, it will be largely uninhabitable even under conservative predictions of sea level rise, due to a lack of freshwater caused by changing rainfall patterns and saltwater intrusion. Sufficiently uninhabitable that in 2008, former President Mohamed Nasheed began investigating the outright purchase of a new homeland – somewhere in India, Australia, or Sri Lanka perhaps – for his people. This Wednesday, Aug. 13, in collaboration with the Center for Biological Diversity and the MV Film Society, VCS co-hosts a screening of the Oscar- and Emmy-winning documentary film The Island President. The film tells the story of President Mohamed Nasheed’s efforts to raise awareness around climate change issues and protect his island nation from the rising seas. Catherine Kilduff and Valerie Love from CBD, along with Jeremy Houser from VCS, will share their thoughts on sea level rise; as a special guest, Frostpaw the polar bear (CBD’s climate change mascot) will be serving refreshments and speaking with guests. Pre-sale tickets to the 7:30 screening at the MV Film Center’s Marilyn Meyerhoff Theatre (in Tisbury Marketplace, VH) are available at the box office and at their website. If you’d like to learn more about how sea level rise will affect our Island, you’re in luck: VCS is, pardon the pun, awash in information about our rising seas. In a piece for the Vineyard Gazette, Liz Durkee of the VCS Board presents an excellent introduction to the many issues surrounding the heavy topic. Staffer Jeremy Houser’s report on the subject adds more specifics to the predictions and delves into the scientific background of why the seas are rising. And former Board member Phil Henderson’s "Rising Seas" presentation (video here) provides a great visualization of which areas are most likely to find themselves underwater in the future. In the last Almanac, we took on the widespread phenomenon of unnecessary engine idling. This week, we step back from the technical talk (like how the emissions system that makes your exhaust safer for breathing doesn't work properly until the car warms up, and this is best done while driving, not idling) to simply call out one egregious point source of socially acceptable mass-action idling: the car staging area at the Steamship Authority. 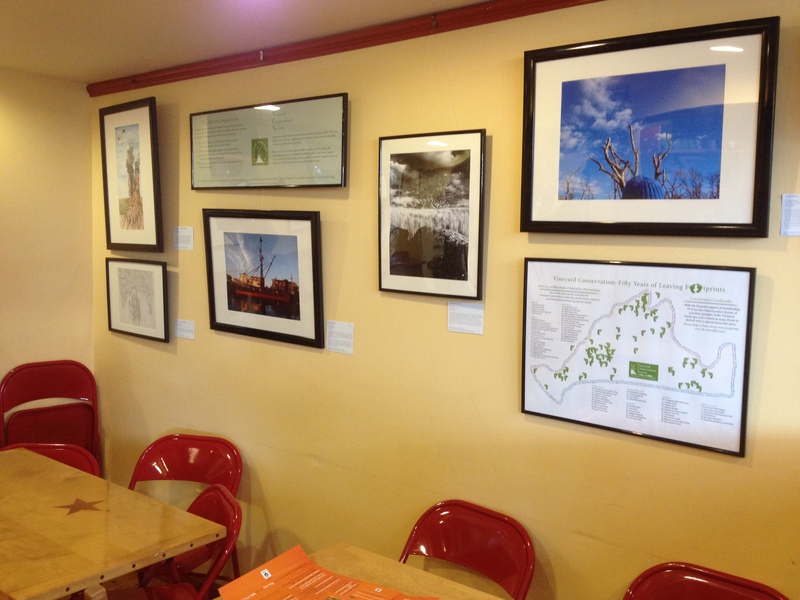 For the rest of August, check out selections from the first VCS high-school art contest, The Art of Conservation, on display at Mocha Mott's (Circuit Ave. in Oak Bluffs). Or, brew a cup at home, get comfortable, and view the art at our website. 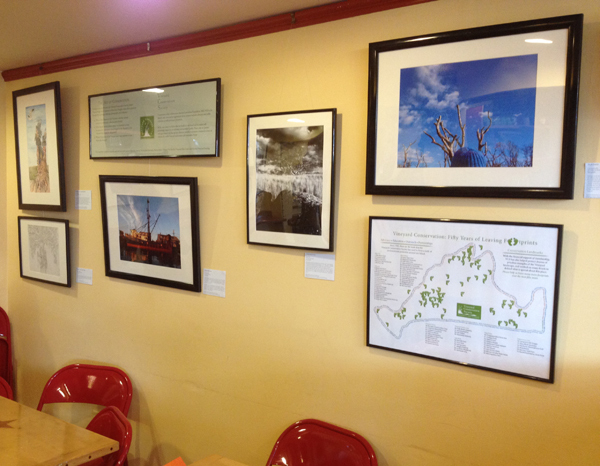 Many thanks to Mocha Mott's for hosting these great works!